Proper Nutrition is a cornerstone of healthy living, yet malnutrition is a major challenge in Africa. The solution to this needs an all hands on deck approach. It was for this reason that a high-programmed action plan was adopted at an international conference on “Food Security, Dietary Practices and Non-Communicable Diseases” in Ghana on August 11 under the sponsorship of AstraZeneca and Edusei Foundation. The event was to raise awareness of the link between food security, insufficient diet quality and non-communicable diseases with its serious impact on health and socioeconomic development in Ghana. The conference devised strategies that are needed to control non-communicable diseases (NCDs) in the Country. The event was moderated by Dr. Matilda Asante, a Senior Lecturer in the Department of Nutrition and Dietetics, School of Biomedical and Allied Health Sciences, University of Ghana and Past Vice President, Ghana Dietetics Association. The inaugural session of the conference began with a brief address and prayer by the Provost of the College of Health Science (CHS), University of Ghana, Prof. P. F. Ayeh-Kumi. The formal sessions of the conference started with a keynote speech by Dr. Margaret Udahogora, Director of Dietetic Program, Department of Nutrition and Food Sciences, University of Maryland, College Park, USA. She highlighted the modifiable risk factors for NCDs in both high and low income communities and the role of food security and a multisectoral approach to NCD prevention, noting that food security includes four pillars of availability, accessibility, utilization and stability to meet nutritional needs. A panel discussion comprising of Dr. Ebenezer Appiah-Denkyira, Director General, Ministry of Health, Ghana; Dr. Francis Appiah, College of Agriculture and Natural Resources, KNUST, Ghana; Dr. Gladys Peprah Boateng, former Chief Dietitian, 37 Military Hospital, Ghana and Dr. Iristide Ekow Essien, a UK Community Development, Policy Development, Social Enterprise Specialist, all called for a need to strengthen a multi sectoral commitment for combating NCDs by scaling up action across the various government and private sectors. The panelists highlighted the challenges of attaining food security for regular utilization of safe and nutritious foods as well as the health related consequences such as under nutrition, overweight/obesity, diabetes, high maternal mortality, and other NCDs. Issues relating to existing curative (rather than preventive) care were addressed and they called for a stronger public health institution, quality of health care and improved capacity in policy making and implementation, with responsive and equitable health systems. 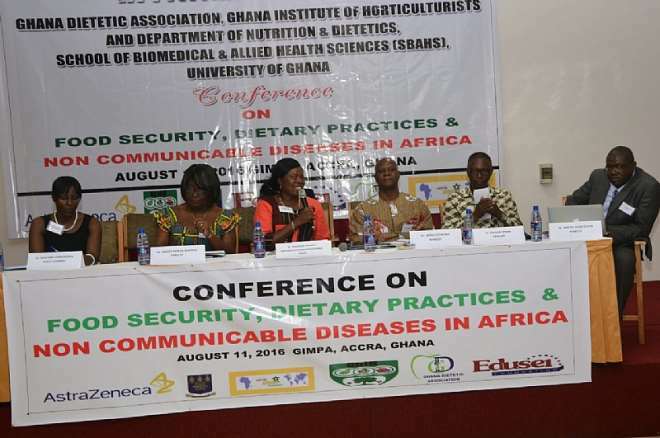 This was the first conference of its kind being hosted under a public private partnership of Let’s Go Africa Foundation, School of Biomedical and Allied Health Sciences, Ghana Institute of Horticulturists and the Ghana Dietetic Association - sponsored by the private sector and major NGO. Expert delegates from governmental agencies and scientific societies came from Ghana, United States, United Kingdom and the State of Qatar. During break sessions, AstraZeneca, a sponsor of the Conference, spelt out evidence relating to the magnitude and impact of non communicable diseases on health and on the economy of African Countries. Their efforts to roll out a Healthy Heart program in all African Countries, its Enidaso medical program in Ghana and other AstraZeneca multimedia videos were shown to enhance learning materials on NCDs in Africa. Delegates were thrilled to hear about the social protection program in Ghana by Edusei Foundation, a Conference sponsor, on its educational workshops that has reached and trained about 5000 youths in Ghana and the Diaspora and Edusei Foundation International center at Bekwai in the Ashanti Region of Ghana. Their short video captivated the audience to an unimaginable point. The Conference ended in the afternoon with participants developing an action plan and endorsing strategies to address the challenges faced by the enormity of non communicable diseases and their subsequent social and economic impact in Ghana. The concept of food-based dietary guidelines in Ghana, increased advocacy, high impact interventions, and collaboration were suggested in an actions plan to promote healthy nutrition and a healthy lifestyle.